There have been seven by-elections in Canada in 2017 so far, with four more to come today (December 11th), including a hotly contested race in South Surrey-White Rock. Will Justin Trudeau and Gordie Hogg be cheering tonight? Are there any trends? Any signs that may predict outcomes tonight? First, you have to look at Alberta separately. Three Conservative titans resigned their seats – Rt. Hon. Stephen Harper, Hon. Jason Kenney, and Hon. Rona Ambrose. One might think the loss of those candidates would depress results in a subsequent election. Wrong. The Conservatives scored over 70% in each seat, surpassing already strong 2015 numbers. Moving on to Quebec where there have been two by-elections, it’s a very different story. The Liberal Party held most of its vote in St. Laurent (Stephane Dion’s seat), and in October, doubled its vote in Lac St. Jean to take a Conservative seat held by Denis Lebel. Unlike Alberta where support for the Blues was amped up, les bleus went the other way in Lac St. Jean, dropping from 33.3% to 25.0%. Les oranges dropped in Lac St. Jean from 28.5% and second place to 11.7% and fourth. Finally, there were two by-elections in Ontario in 2017. In both cases, the Liberals only retained about 90% of their 2015 vote, but nevertheless held a majority. Overall, it’s a pretty good result for the governing Liberals thus far. Holding on to their own seats while taking one in Quebec from the Conservatives. Running up the scoreboard in Alberta does little for the Conservatives. Their numbers in the 2015 election were already through the roof – the Harper Conservatives had 375,000 more votes than the provincial PCs and Wildrose combined. The Conservatives are in danger of becoming ‘Alberta Island’ if its numbers drop in the rest of Canada but increase in Alberta. Bonavista and Battlefords both appear very comfortable for the Liberals and Conservatives respectively. It will be interesting to see if Battlefords-Lloydminster follows a similar pattern as the Alberta by-elections. Scarborough-Agincourt is tighter and will be the first real test of Jagmeet Singh and whether he has any game in the Toronto outskirts. You would think the NDP could do better than 7.9%. That could help Andrew Scheer’s Conservatives, and a win there would be huge, but they are certainly downplaying expectations. I looked at South Surrey-White Rock in detail a few weeks ago. A strong candidate for the Liberals and lesser-known candidate for the Conservatives is the reverse scenario compared to the 2015 election. With a thin margin, the Liberals could prevail this time on the candidate match-up alone – everything being equal. Two years into a mandate, you would think this would be a vulnerable time for any government. Given the prolonged controversy over small business taxation in the summer and early fall, one might also think that that issue would hurt the Liberals in the upper-income, professional enclave of South Surrey-White Rock. We won’t know until the polls close if it did – and if Hogg does win, one can ask, “What was that all about?” – a big national issue that had no teeth. I was surprised that the Conservatives reached back to 1993 to attack Hogg on an issue that had been dealt with conclusively in his provincial by-election win in 1997, when his main opponent was a BC Reform candidate. That appeared to be the move of a campaign running out of steam. A Liberal win tonight in BC – and in Scarborough – will be an impressive show of strength by a mid-term government. Not a guarantee of future success, but a sign of resilience, and an indicator of the magnitude of the challenge facing Andrew Scheer. His pathway to winning the next election will be made more difficult not by the actual reality of a by-election loss, but by the perception of that loss among his own supporters (I’ve been there). He’s going to have to demonstrate how he can build his party’s market share beyond Alberta and its diminishing strongholds across the country. But hey, low expectations can be very beneficial (I’ve been there too). Jagmeet Singh will also take away some lessons tonight. He hasn’t been on the job long, but he did enjoy considerable positive publicity in the lead up to his election. Can he translate that into votes? You would think the NDP should get a little bump with Singh in place. Tonight’s results will be another marker on the road to 2019 and, so far, the electoral road has looked fairly smooth for the Trudeau Liberals. Yesterday’s provincial by-election in Calgary-Greenway has contradictory interpretations. 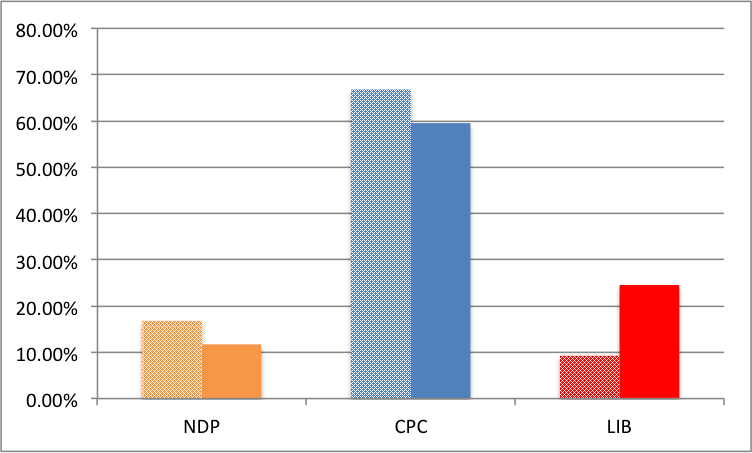 It was a four-way race ranging from 27.7% for the winning PC candidate to 20.2% for the fourth-place NDP. It’s rare to see four candidates place above 20%. I could not find one such example in the 2015 federal election, unless you count Nanaimo-Ladysmith where the four-way race had the 4th place Greens at 19.7%. In Calgary-Greenway, when only 7.5% separates 1st and 4th, it’s hard to see it as Earth-shaking. Nevertheless, the PCs won and a win is a win. Therefore, interpretation #1 is that the PCs are alive, that they must still be reckoned with, and the NDP’s relegation to fourth is a sign of their demise. Interpretation #2 is that the Centre-Left (NDP/Liberal) has made major gains in this riding since 2012 and further reduced the PC-Wildrose combined vote from 2015. In 2012, the NDP-Liberal vote in this riding was a combined 15.5%; in yesterday’s by-election it was 42.8%. It rose from 36.2% in 2015 and given that that was solely the NDP vote, one can see how the NDP benefit from no Liberal in the race. As Table 1 shows, the NDP was actually five times higher than its 2012 vote and the Liberals have doubled from 2012. There is a lot of talk about PC-Wildrose cooperation, but the centre-left should probably be viewed in the same way. Not that there is an imminent merger, but there is a competition for like-minded voters. The Liberals bothered to show up to the by-election after missing the 2015 GE and their impact was significant. That may be in part a result of local candidate influence, but I’m not sure how many saw the Liberals competing to win the seat. Unlike the recent BC by-elections in Coquitlam-Burke Mountain and Vancouver-Mt. Pleasant, turnout in Calgary-Greenway as a percentage of the previous election was relatively high, and as noted, about the same as the 2012 GE. The by-election turnout was about two-thirds of the 2015 GE turnout while the BC by-elections were about 40% of the previous GE. That indicates a higher interest and engagement in the outcome and its possible impact on the next election. If I was a PC or Wildrose strategist, I would interpret this result with some nervousness. The pool of centre-left voters in this by-election was almost evenly split. The voter pool that existed in 2015 massively went toward Rachel Notley’s NDP. 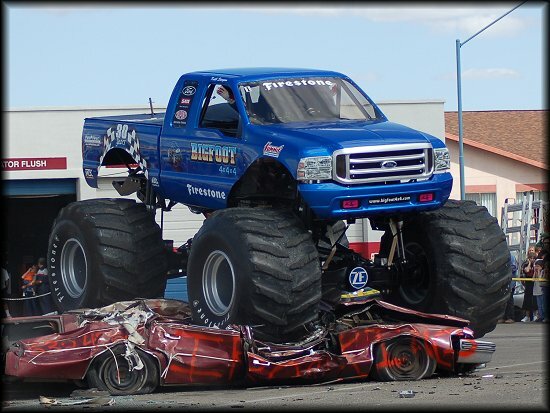 This is basically the Justin Trudeau/federal NDP vote bloc. The Stephen Harper vote bloc was much larger provincially, but is also split. A consolidated centre-left offering (whereas those voters group behind one strong alternative) appears still able to defeat a split PC/Wildrose offering. In reality, it is more complicated than described above. Voters move around between parties with more fluidity – a Liberal may never consider NDP and a PC may never consider voting Wildrose, and vice versa. But the by-election does show that the situation has become more, not less murkier as a result of Tuesday’s outcome. It’s too early, much too early, to write off the Alberta NDP. Finally, it must be noted that – probably for the first time in Canada – there was a competitive four-way race between four South Asian candidates. This may well have created a dynamic that disrupted prevailing provincial political currents. I’m not close to the ground so I defer to others and invite comments. 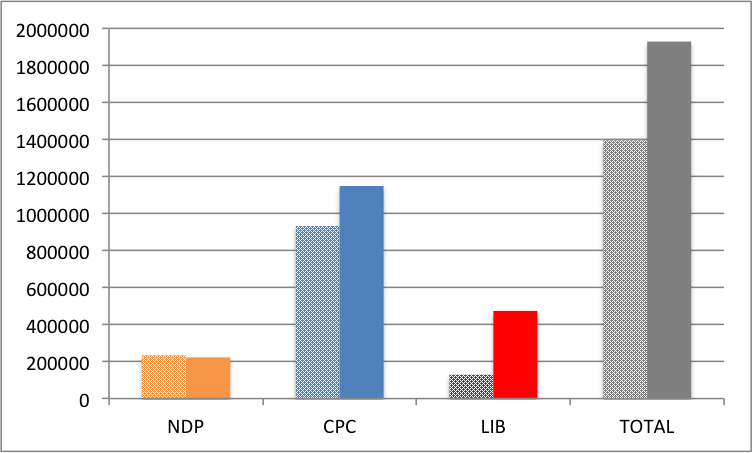 Regardless, the fact remains that the market share for the Centre-Left in this riding has increased sharply since 2012. Wildrose + PC = Federal Conservative voters in Alberta, right? 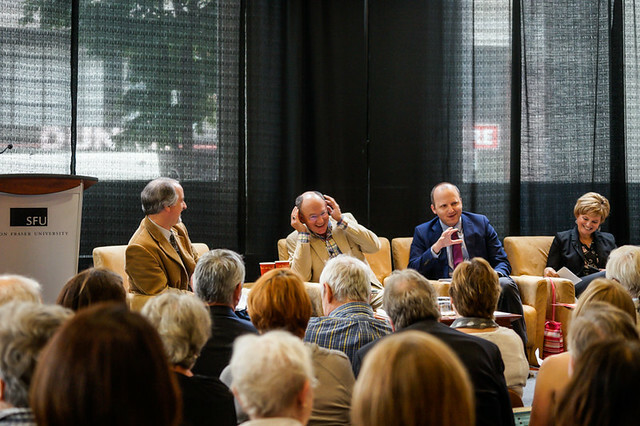 Will the big bloc of federal blue voters drive over the Alberta NDP next election? And the most surprising to me – the federal Conservatives had 375,000 more votes than the two ‘conservative’ provincial parties (PC and Wildrose) combined. 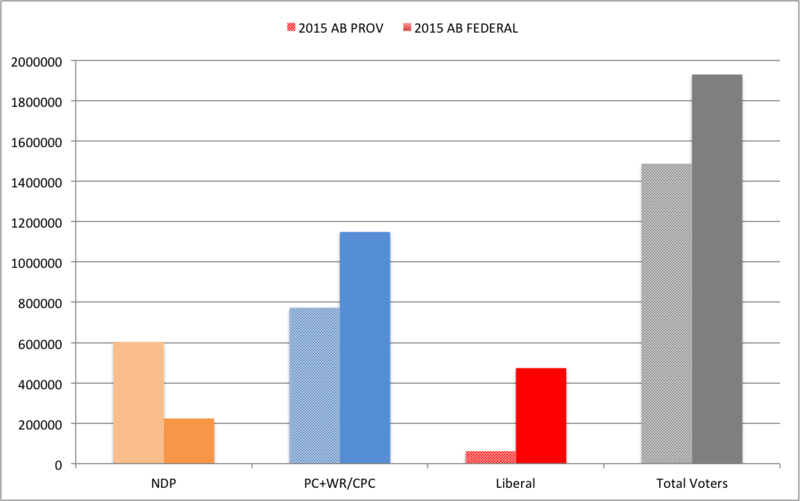 Chart: Comparing the 2015 Alberta provincial results to 2015 Alberta federal results in TOTAL VOTES. Note: Wildrose and PCs combined and compared to federal CPC. So, 442, 296 more Albertans voted in the federal than the provincial, despite the fact that the Alberta provincial election was a once-in-a-generation change. These ‘new’ voters didn’t necessarily march to the polls to trounce Harper – there was a bit of that – but many may have been small ‘c’ conservatives sitting out the provincial election. While the provincial turnout was higher than normal at 58%, the federal turnout this month was 69%. Leaving the May 2015 provincial election aside for a moment, both the Conservatives and Liberals made gains in total votes, while the NDP was flat. Because turnout was much higher, the NDP and Conservatives lost market share while the Liberals went way up. The Liberals go way up in votes and market share; the Conservatives go up in votes and down in market share; and the NDP are flat in votes and go down in market share. Well, you gotta be dispirited if you’re an NDPer. On the surface, it makes the May 2015 results look very fleeting and surely there were hopes last May of a “Quebec-Alberta bridge” that could have delivered a federal NDP win, a’ la Mulroney 1988 and many PMs in the past. Don’t despair, orange friends. When you look at it a little deeper, a combination of federal NDP and federal Liberal voters makes for a significant voting bloc, one that is larger than the NDP vote from last May. It’s a salivating prospect for non-NDPers in Alberta to consider how to harness the power of the federal Conservative voting bloc. It remains the most dominant political base in the province, but has been divided provincially in recent years. Also, just because some Notley voters would have voted CPC doesn’t mean they won’t return to Notley next election. Governing well is the key to success for Premier Notley. She will need to try to not awake the Beast – those million-plus federal Conservative voters. She cannot do much to keep the conservative base from unifying – that’s on them, and it won’t be easy given the cultural differences at the provincial level between PCs and Wildrose. On her end, she will be very keen to unite ‘progressive’ voters and appeal to those 473,661 federal Liberal voters that were energized by Justin Trudeau, most of whom residing in Calgary and Edmonton who largely voted for her last May. Putting all her eggs in the NDP-brand basket is a non-starter in Alberta. The Premier of Alberta making nice with a Prime Minister named Trudeau… now that would be something.